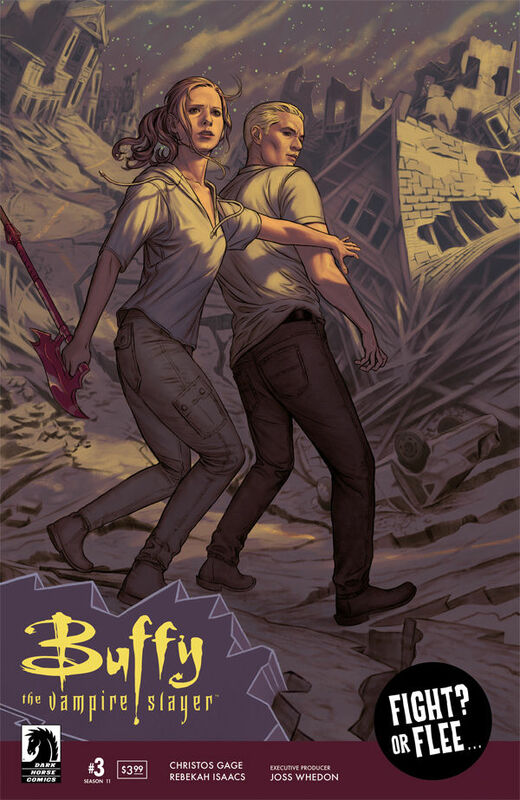 With the magical folk in the US being cataloged and relocated to a “safe” place, Buffy and her friends will have to decide if they will be divided . . . Or if they will try to run. With Slayers being recruited to help police the magical folk, escaping might not be so easy. As a dyed in the wool conservative and gun rights advocate, I just couldn't miss the bit about the Scythe ("From my cold dead hands," made famous, and controversial, by the late, great Charlton Heston) and the acknowledgement, "Hey, there's still a Second Amendment." Nice to know that Slayers, at least, still have Constitutional rights, and in a super liberal place like California, no less. I do think that there should be some feed over into "Angel" about the conditions in the U S. Even though London does apparently have its designated demon town, it doesn't seem to be as restrictive there as what's going on in San Francisco. Is this Safe Zone built in the Sunnydale crater? Really liking this season so far. I'm just really digging Buffy as a character, like her fight with Jordan, and her decision to go to the camps. Same with Willow-- I hope they try to keep incorporating Willow's narrative more into the story after getting her so little in S10. Really enjoyed this, especially Buffy kicking Jordan down the stairs, she so deserved it. Loved the politics of it all, makes it feel very real and relevant. Also love the Spuffy of course. All the characters felt right. Given the fact that Buffy is now living in San Francisco, I think that Alcatraz Island might be appropriate. Yeah but they drive for a long time. And get there by bus. So while cinematic, doesn't seem like what the book is going for. Hi! I'm new! I just finished season 11 #3 and was hoping for someone to talk to about it and found these forums. Yeah google! I also wondered if the new internment camp Buffy, Willow and Spike find themselves in is the former Sunnydale. That last page really made me think it might be. I've been really enjoying this season. Buffy feels very grown up and adult-y, so that is a nice change. Curious about the plot! Hope Willow will have a bigger role in this season! I was wondering about the timeline actually. I'm not too clear on how long is meant to have happened since the dragon? A little while at least; they were in the FEMA trailers for a while. And I'm unclear on how long seasons 9 & 10 are supposed to have taken. I think it's at least a possibility at any rate. Won't be surprised! I'm pretty sure someone made a timeline of the comics. It was somewhere here on the board, but not entirely sure. I'm recalling this from memory so don't quote me on this! Season 8 starts one year after Angel ended and is about 18 months long. Then season 9 and 10 are both a year each. Then I'm considering when season 10 ended and season 11 started as the little bit of peace...so about 3 months and I think season 11 will be about 6 months long. 3 months seems like enough time to build a facility like this? I mean they might have already started back in season 8 when the magic stuff was exposed! Hey all! I actually discovered these boards from googling on the question of whether the internment camps are in Sunnydale. So, that's defo where my thinking went as well, 2nd option was The Grand Canyon (that would be about 11 hours to drive, which doesn't go against anything that I saw, but they really don't look that deep down, so I doubt it). In terms of it popping up very quickly I can see the read that they've been planning this for a while and that they were just biding their time, waiting for something big to happen so that they could use it as an excuse. But, considering that a majority of the living spaces are mobile homes, I don't have that hard of a time imagining this being thrown together last minute as a way to publicly respond to an excess of deaths. I do wonder where the camps are in other parts of the US and if they are managed similarly--in the Buffyverse we stay pretty CA-centric, but the demon population is likely not (I mean, there's a hell mouth in Ohio). Damn, have no punches been pulled in this season thus far. Buffy and Spike travel to the Safe Zone on a bus and it apears to travel overnight, so possibly a 5-7 hour drive. I don't like in the US so I have no idea where an 7 hour drive from San Fran would lead. But it doesn't appear to rain there much, so I think it's somewhere South. Yeah, and I suppose there are many different canyon-like spaces they could be in. But the more this goes through my head the more certain I am that it's in the Sunnydale crater. SF to Santa Barbara County is about 5 hours driving, which fits well enough in the timeline. (Santa Barbara county is widely believed to be where Sunnydale would be, from wikipedia for ease: The episode Pangs reveals that Sunnydale is in the former homeland of the Chumash people, which is the area northwest of Los Angeles, centered on Santa Barbara County." Further supporting this, in Shadow "805" is established as the area code for Sunnydale, and one of the three places it might be is Santa Barbara County--either way, we're working with somewhere close to the ocean and the desert with an international airport and one Starbucks). Further, I feel like Buffy's expression upon seeing it was peppered with annoyance, and seeing her Sunnydale crater being used thusly would certainly do that (let's hope that hell mouth is really quashed, eh?). Also, when half your prisoners are vampires it seems other-worldy cruel to make them all live somewhere that is incredibly sunny. Take them to Washington! You could be right, but wouldn't Buffy/Spike/Willow have mentioned it by now, even in passing, that they're back to where they began? It seems odd they haven't. Plus wouldn't the Sunnydale crater be full of debris, and this place seemed pretty empty apart from the caravans. You aren't wrong on that, not mentioning it would read missed opportunity, and this sort of opportunity is rarely missed by Buffy writers. Great issue. Loved the Buffy/Jordan stuff and I admit I did laugh at Jordan telling Buffy that she developed a vampire fetish. I'm loving Willow a lot this season. She's always been a good teacher/tutor, etc. so I think her taking care of people and being in charge that way brings out the best in her. The Buffy/Dawn goodbye made me sad. I don't like the idea of not having any scenes between those 2 for the rest of the season.